CIMMYT and Wageningen University are looking for three highly motivated and inquisitive PhD candidates to investigate the development trajectories of cereal-based systems in Mexico, South Asia and Ethiopia, major drivers of change, and impacts on agroecosystem processes across spatial and temporal scales. This knowledge will be used to analyse and explore how promising technological and institutional innovations targeting sustainable intensification can more effectively improve rural livelihoods and environmental quality in these agro-ecosystems to better inform development actions and policy. The first peer-reviewed publication of the Systemwide Livestock Programme (SLP) crop residue project is now on-line in Field Crops Research. This paper describes the options and challenges of Conservation Agriculture (CA) in mixed systems by comparing 12 study sites in 9 countries across Sub-Saharan Africa and South Asia. Results illustrate that “despite its potential benefit for smallholder farmers across the density gradient, the introduction of CA-based mulching practices appears potentially easier in sites where biomass production is high enough to fulfil existing demands for feed and fuel. 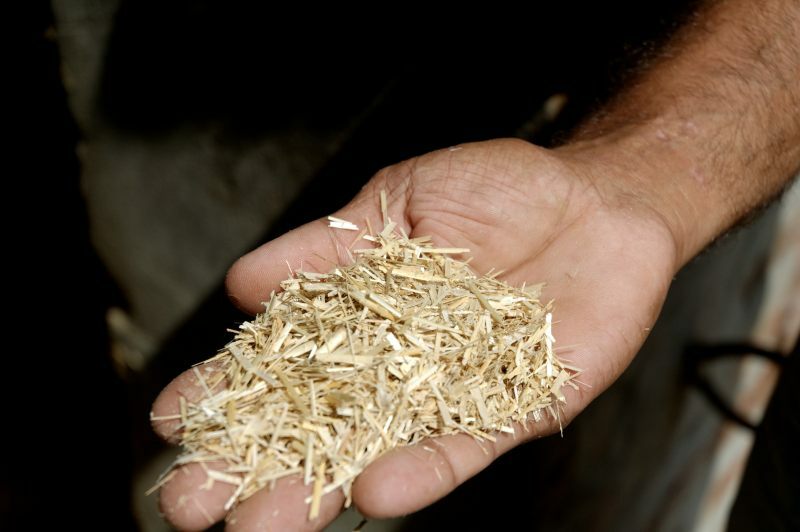 In sites with relatively high feed and fuel pressure, the eventual introduction of CA needs complementary research and development efforts to increase biomass production and/or develop alternative sources to alleviate the opportunity costs of leaving some crop residues as mulch”. This is the result of collaborative research of different CGIAR centers and other institutions: SLP, ILRI, CIMMYT, ICRISAT, IITA, CIP and Wageningen University. Last week, the crop residue trade-offs project team met in Addis Ababa to take stock of the data collected across all four regions (South Asia, Southern Africa, West Africa and East Africa). The idea was to see how we could build on and use the data collected towards practical solutions on how residues could be used better for livelihoods and the environment. Another key discussion point was about how the research momentum on crop livestock systems built up during the lifetime of the CGIAR Systemwide Livestock Program (SLP) could help to shape the new CGIAR Consortium Research Programs (CRPs), especially the ‘system CRPs’,1.1 and 1.2, which are meant to integrate research results from all other CRPs). The workshop included representatives from the four regions where SLP works as well as guests from different institutions: CIMMYT (International Maize and Wheat Improvement Center), ICARDA (International Center for Agricultural Research in the Dry Areas), ICRISAT (International Crops Research Institute for the Semi-Arid Tropics), IITA (International Institute of Tropical Agriculture), ILRI (International Livestock Research Institute), the University of Minnesota in the US and finally from Wageningen University in the Netherlands. Phase I of the crop residue trade-offs project developed a description of residue use and identified determinants of use and potential effects of different uses for livelihoods and the environment. This was based on a socio-economic analysis of 12 study sites across the SLP regions, based on village and household level surveys. The first day of the workshop included an update on the progress of each region, identification of major lessons on both process and content and an overview on the current data analyses. Most regions have finished data entry and are busy cleaning data from errors and missing information. General lessons are: residues are mostly grazed or fed; trade-offs depend on both production and demand, but they are still more evident in low intensive agricultural sites; the participation of farmers and other stakeholder is essential to identify potential Technological, Institutional and Policy options (TIPs). Regional reports should be ready by end of March 2012. These will include a general descriptive analysis, as well as simple econometric approaches to identify determinants of crop residue use. Phase II aims to identify promising TIP options to reduce trade-offs in crop residue use. A consultation with external ‘experts’ and unfolding SLP internal discussions seemed to agree that a more participatory approach will bridge the diagnostic phase I into a more practical phase II. The SLP does not have either the resources or the long term timeframe to embark on action research, therefore phase II should be seen as a transition phase that can help link SLP research to ongoing and new projects or to develop new proposals to go beyond diagnosis. On the last day of the workshop, we started with a description of CRP 1.1 and 1.2 and went on to discuss how SLP can share some experience on systems research and institutional collaboration, which have been major SLP principles. Additionally, a work plan for 2012 for Phase II was mapped out. Phase II will focus on well-defined consultations with farmers and other stakeholders in the different regions to identify promising TIPs, and to enrich the already quantitative description of crop residue uses and trade-offs with a more qualitative analysis across study sites and households in mixed crop-livestock systems. 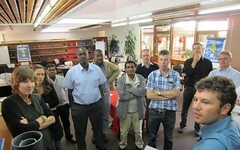 This workshop marked the beginning of the last year of the SLP and the crop residue trade-offs project. We hope to keep enriching the research of the CGIAR centers and projects with experiences in system analysis and intra-CGIAR collaboration. We also plan to make full use of the time remaining to move into a more action-oriented mode. We will identify promising TIPs that will tackle trade-offs in biomass use to the benefit of the livelihoods of the rural poor and the long term sustainability of rural regions in the developing world. SLP has been strengthening links with different academic institutions. The result of these links has been a small set of internships, BSc or MSc thesis with various universities. Research topics are diverse trying to investigate the complexity of mixed crop-livestock farming systems from different but complementary disciplines, tools and scales. Topics include: biomass production and management; chronosequences, land-use/cover and soils evolution; and remote sensing, NDVI analyses and R scripting. Crop residue management and farm productivity in smallholder crop-livestock system of dry land North Wollo, Ethiopia (Hailu Terefe, Wageningen University, The Netherlands). The objective of this study is to explore and analyze crop residue and manure management practices and their influence on farm productivity. Data collection and analyses include farmer resource allocation and socio-economic by semi-structured questionnaire; biomass production, N content and digestibility of crop residues and soil nutrients; and crop-growth simulations to explore the influence of crop residue management use on farm production. The results show that nutrient contents and physical structures of arable plots are declining. Modelling results suggest that to reverse this situation, farmers should retain about 70% of crop residues in the field; but retention should ensure incorporation into the soil. To achieve this strong interventions are needed. Development of an open source tool to analyze Vegetation Index from Remote Sensing data (Romain Frelat, INSA, France). During this internship, I have developed a free package in R to conduct automated analysis of Normalized Difference Vegetation Index (NDVI) from different optical satellite instruments (AVHRR and Spot Vegetation). Land Surface Phenology metrics can be easily computed from points or polygons generated either in GIS software (shp) or Google Earth (kml). Metrics and vegetation anomaly maps are calculated for every cropping season to support the study vegetation dynamics in agricultural landscapes. Evolution de l’occupation des terres en lien avec les caractéristiques physico-chimiques du sol dans un village pres de Nekemte, Ethiopie (Matthieu Crespin, UCL, Belgium). C’est dans ce but que ce travail, réalisé à l’échelle du village, devrait permettre de quantifier et de comparer la qualité des sols pour des occupations et des situations topographiques différentes : cultures, pâturages, forêts d’une part et vallées, pentes et sommets d’autre part. Il devrait également permettre de tracer l’évolution de la fertilité pour des sols de forêt jusqu’à des sols convertis à la culture et ce pour trois groupes d’âges différents. Smallholders in mixed crop–livestock systems make up a large proportion of the farming enterprises in developing countries. In these systems, crop residues are an important component of production since they have multiple uses including livestock feed, construction materials, cooking fuel and organic fertilizer for the fields. Mixed crop–livestock systems are very dynamic and are evolving rapidly in response to external drivers such as demographic pressure, development of urban markets, climate variability and climate change. In addition, recent interest in biofuels has further implications for land use and resource allocation. This study aims to improve understanding of the tradeoffs among different crop residue uses in cereal-based systems in four regions: millet-, sorghum-, and maize-based systems in West Africa; maize-based systems in eastern Africa, maize- and sorghum-based systems in southern Africa; and wheat/rice-based systems in South Asia. The major trade-off in most systems is the short-term benefit gained from using crop residues to feed livestock versus the longer-term benefit gained from leaving crop residues in the field to improve soil fertility and control erosion. The study focuses on decision-making processes at the farm and household level and the findings will capture the diversity and contrasts as well as recent changes in crop residue uses at various scales. The results will help decision makers to target technical, institutional and policy options to improve livelihoods, without compromising the long-term sustainability of these farming systems. Can bio-energy replace petroleum in Kenya? An interesting study by Wageningen University which unfortunately ignores completely livestock in the system, crop residues playing a major as feed. System specific trade-off analyses are certainly needed to assess competitive use of crop residues to either feed animals, maintain soil productivity or produce energy looking both at short and long term impacts on livelihoods and system productivity. The CGIAR Systemwide Livestock Programme ran from 1995 to 2012. Basic information on its activities is accessible from this website.